Melt butter in an 8-inch ovenproof skillet over medium heat. Add leeks and carrots and cook until softened, 4-5 minutes. Stir in garlic and cook for an additional 30 seconds. Stir the flour into the vegetables and continue to cook for 30 seconds while stirring. Stir in the stock, cream, salt, thyme, and pepper. Turn the heat up to medium-high to simmer the filling and thicken it to almost the consistency of a thick pot pie (it will continue to thicken as it bakes!) Taste and adjust for seasoning. Stir cooked chicken, frozen peas, and parmesan into the mixture and remove skillet from heat. Allow to cool slightly. Place skillet on a baking sheet to catch any drips and bake for 25 to 35 minutes, or until pie crust is golden brown. Different pie crusts will take different amounts of time, so start checking on it at the 25 minute mark. Use a big spoon to dish the pot pie into two shallow bowls. Enjoy! Don’t have an 8-inch skillet? You can use a 10 inch skillet, or divide the pot pie filling between two large ramekins or ovenproof bowls, top them both with pie dough, and bake. Don’t want to buy an entire rotisserie chicken? Cook one medium chicken breast and shred it, that’ll be about the right amount of meat. Vegetarian? Swap in quartered, sautéed mushrooms for the chicken. Your skillet will be very full at first - don’t worry, the leeks will cook down to give you more room to work. 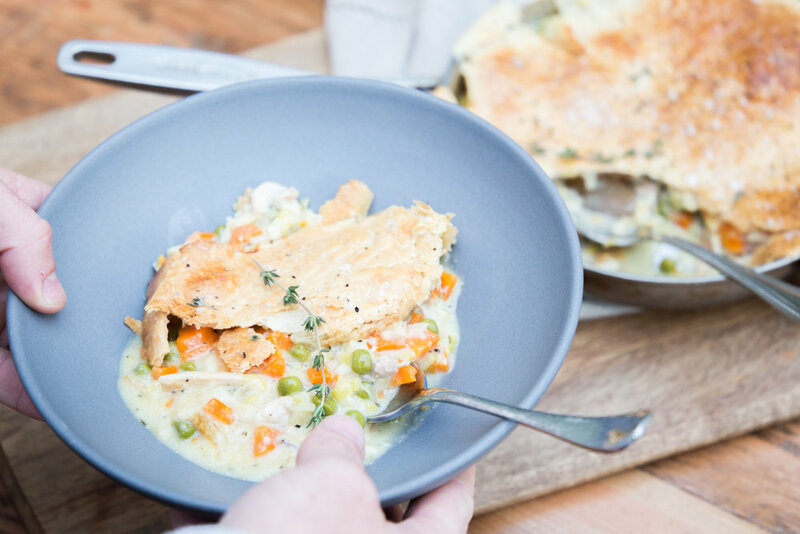 If we weren’t trying to cook this entire pot pie in one skillet we’d use a larger skillet, but we are minimizing clean up here, people! Most pot pies have celery in them, but I hate asking you to buy an entire head of celery just to use one stalk. If you already have it in your fridge, dice up a stalk and add it in the with leeks and carrots. FYI, you can often buy carrots individually so that you don’t have to buy a whole bag. If you already have a small yellow or white onion (or can’t find a leek! ), you can use it (diced) in place of the leek. But I highly recommend going for the leek. I saw a pot pie recipe on @foodandwine where they use white country bread instead of pie dough. If you wanna give that a go, just cut off the crusts, cut it to cover the filling in one layer, and proceed with the recipe! 1 to 2 cups of ANY veggie works (in place of the carrots and peas). If you already have cauliflower and corn, use that! Potatoes and parsnips? Cool! Broccoli and zucchini? Right on. You get the picture. You can pretty much pot-pie anything. Trader Joe’s frozen pie crusts are the BEST frozen product you can find!